The other night Jon Stewart derided facile analogies regarding the demonstrations in Madison, Wisconsin. Madison is NOT Cairo, he protested a tad too much. Since I don’t work for Fox News, I’m not about to defend facile analogies, but I am going to make an admittedly risky comparison. No, this is not Madison, either. It is, or was, the Pyne Gould Corporation building in Christchurch, New Zealand. 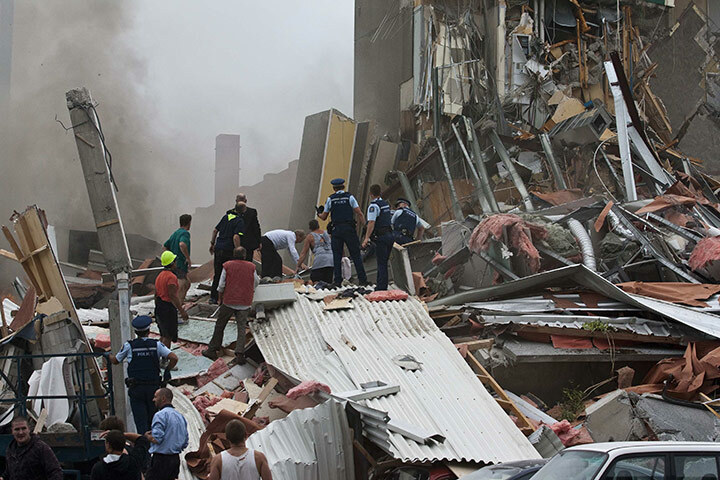 The 6.3 magnitude earthquake that struck the city on Tuesday has compressed the four-story building to one mangled pile of steel and concrete. 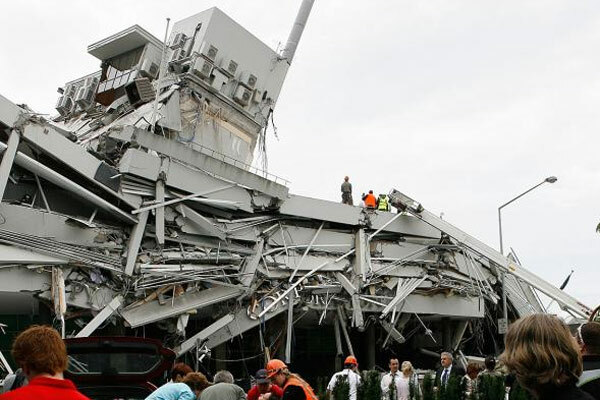 The seismic wave has passed, but the building now looks like a ship that has been wrecked by military attack, like a half-sunken vessel at Pearl Harbor. The bridge, though still intact, leans dangerously as the rest of the structure has run aground, slammed into ruin when the earth was moving like the sea. The scene now is calm, and one could almost see the building as a curiosity. Rescue workers, officials, and the occasional victim or bystander are evident, but everyone is seems a bit idle, almost perplexed about what to do next. In fact, a larger version of the shot reveals that people are competently problem solving as they sort out the casualties and consider what to do next. Public servants and private citizens are quickly and effectively coordinating their efforts to limit harm. So what does this have to do with Madison? The clue is provided by the letters still visible amidst the wreckage: CORP OR and we can’t quite make out the rest, but we know what it said: corporation. Pyne Gould is a business, a for-profit entity that will contract with workers for their labor in exchange for wages. When you see the corporate building reduced to rubble and completely dependent on the state for rescue, it becomes a tad harder to see taxation as a grave burden. Most important, however, here you can see the corporation as a collective entity: as a building that contained lots of employees, as an enterprise that provided products or services for lots of customers, and, by extension, as a business that did so on behalf of the many stockholders or other people who invested in or owned the business. Why do I mention this perhaps obvious point? Because I am getting very irritated by the continual stream of news reports and editorials that describe (and often decry) the “collective bargaining” done by the unions under siege in Wisconsin and a number of other states having Republican majorities. Why should there even be collective bargaining, many ask, when other workers don’t have the option? (This is like saying that no one should get medical treatment since I currently don’t need, want, or have it.) Most significantly, it seems unfair for a collectivity to gang up on the corporation, which is seen as a single entity. (In Madison, the corporation is the state government, but the appeal is the same: unfair to join forces against the single employer.) Of course, the corporation is a single individual before the law–but so is the union, so that legal fiction provides no basis for defining only one side of the negotiation as collective. Corporations are just what the name says: corporate, collective bodies,. They, too, engage in collective bargaining, but on behalf of the owners or shareholders, not the employees. There is no great harm in that, by the way: bargaining between groups is the key to a successful democratic society. What is harmful is an ideology that masks one set of economic interests while making a corresponding set of concerns a target for denigration. Which is why images of catastrophe can provide a civic education. When disaster strikes, the executive can be crushed just as easily as the janitor. When the facade of tall buildings is torn away, the rubble can expose the extent to which modern societies are complexly interwoven and comprehensively vulnerable. Individuals remain valuable–even individual commercial corporations, and even stiff-necked governors bent on using an economic disaster as cover for political warfare–but they thrive only because society is already a vast, interconnected field of much larger things: buildings, transportation systems, state governments, global corporations, and even unions. When disaster strikes, we can learn how it is that all bargaining is collective bargaining. Photographs by Reuters and Christchurch Press/Reuters. Next Post →Carnival Citizenship: Chaos … or Clarity? There are other useful lessons to be gleaned from events in Madison. The decline in union power can be partly attributed to the development of a comfortable reliance by unions on lawyers and lobbyists in place of individual responsibility and collective action. The public employee unions in Wisconsin and elsewhere are demonstrating that it is still possible to take effective action outside of a political system dominated by big money, cynical politicians and consistently anti-union courts. I think the realization that stepping out of the box is a viable answer to the structure of oppression does connect Madison and Tahrir Square.